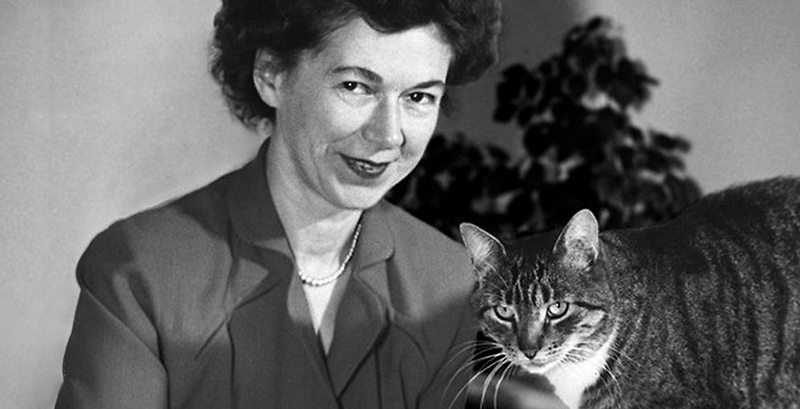 A Week to Remember: Happy Birthday, Beverly Cleary! Beverly Cleary was born on April 12, 1916. Cleary is an author of children's books, and since her first book was published in 1950, more than 90 million copies of her books have been sold. Cleary was a children's librarian in the 1940s, and the children at her library complained that there were no books about children like them, books that told realistic stories about ordinary kids. She began writing with those complaints in mind. Her first book was Henry Huggins (e-book | e-audio | print | audio), and its central character was an ordinary kid living in mid-century suburbia, getting into comical misadventures with his dog, Ribsy. Cleary wrote five more books about Henry between 1950 and 1964. The second book in the series, Henry and Beezus (e-book | e-audio | print), introduced Henry's neighbor, Beatrice "Beezus" Quimby, and her 4-year-old sister, Ramona. And as popular as the Henry books had been, Ramona was an even bigger success. Between 1955 and 1999, Ramona starred in eight books, progressing from pre-kindergarten to fourth grade. She was an energetic little girl who wanted to be liked and respected, but whose curiosity often got her into embarrassing trouble. Ramona faces the sort of problems common to children of that age—sibling rivalry, death of a family pet, coping with bullies, a new baby in the family—with high spirits and great imagination. Joey King and Selena Gomez play the Quimby sisters in the 2010 film adaptation Ramona and Beezus . Other memorable Cleary characters include Ralph S. Mouse, who starred in The Mouse and the Motorcycle (e-book | e-audio | print | audio) and two other novels; and Leigh Botts, a middle school student featured in two novels, beginning with Dear Mr. Henshaw (e-book | e-audio | print | audio) about the letters he writes to his favorite author. Dear Mr. Henshaw received the American Library Association's Newbery Medal, awarded each year to the best American children's book, in 1984; two of Cleary's Ramona books were runners-up for the award, receiving Newbery Honors. Those are only a few of the many honors Cleary has received. She was the 1975 recipient of the Laura Ingalls Wilder Award for a lifetime of substantial contributions to children's literature. Cleary was named a Living Legend by the Library of Congress in 2000 and received the National Medal of Arts in 2003. In a 2012 survey of school librarians, three of Cleary's novels placed among the top 100 children's novels of all time—Ramona the Pest (e-book | e-audio | print | audio), The Mouse and the Motorcycle, and Ramona and Her Father (e-book | e-audio | print | audio). Cleary has written two memoirs, A Girl from Yamhill (e-book | print) and My Own Two Feet (e-book | print). George Frideric Handel's oratorio Messiah was performed for the first time, at a charity concert in Dublin. The piece was written for a relatively small chorus and orchestra; the first performance was done by about 30 singers, and an orchestra of strings, timpani, 2 trumpets, and organ. As orchestras grew larger in the 19th and early 20th centuries, later composers arranged Messiah for increasingly massive forces; an 1857 London performance featured a chorus of 2,000 singers. By the mid-20th century, performances closer to Handel's original conception were becoming the norm. Numerous performances of Messiah are available for streaming and on CD. Betty Ford was born. Ford was First Lady of the United States from 1974 to 1977. She was unusually outspoken on public and social issues, including being a vocal supporter of the Equal Rights Amendment. She spoke openly about her own health, raising awareness of breast cancer after her mastectomy in 1974. After leaving the White House, Ford acknowledged her battles with addiction to alcohol and painkillers; in 1982, she founded the Betty Ford Center for the treatment of addiction. Lisa McCubbin's Betty Ford (e-book | e-audio | print) is a thorough biography. Alan Ayckbourn was born. Ayckbourn is a British playwright and director who has written more than 70 plays. Several of his plays are written to be performed in unusual ways, The order of the five acts of Rondelay varies at each performance, determined by drawing colored balls from a bag; House & Garden is a pair of plays designed to be performed at the same time, by one cast, on adjacent stages. The three romantic farces that make up The Norman Conquests (e-audio | print | DVD) aren't meant to be performed simultaneously, and each stands alone as a complete story, but they are set in different rooms of the same home on the same weekend. Charles Burnett was born. Burnett is a director of feature films and documentaries; The New York Times has called him "the nation's least-known great filmmaker." His fiction films often focus on the lives of working-class African-American families; his first film, Killer of Sheep, centered on a slaughterhouse worker in Watts. In his documentary, Nat Turner: A Troublesome Property, Burnett looks at various historical and fictional treatments of Turner's 1831 slave rebellion, with a different actor playing Turner in each version of the story.